All you have to do is watch & follow along as I tap gently on a series of acupressure points with two fingers, and then repeat the words after me. Once you complete your first round of tapping, you can test your resistance level by visualising yourself celebrating your progress with a little victory dance! If you feel light and happy about the idea of doing a victory dance, your energy is in the right place. If you feel negative or cynical about celebrating your progress, you can reduce the intensity of these feelings by continuing with a few more rounds of tapping. The Tapping script in the video is adapted from the teachings of one of my mentors, Margaret Lynch. It’s designed to get to the inner core of why so many people struggle to recognise their own efforts – and it boils down to one simple concept – believing that we’re not good enough. This belief forms during early childhood and continues to weigh people down throughout their adult lives. Even though we may not even remember where the belief came from, it exists in the form of negative energy that runs through the nervous system. Tapping is extremely powerful because it breaks this cycle of negativity by neutralising the toxic energy you’ve been carrying – and it happens really quickly. 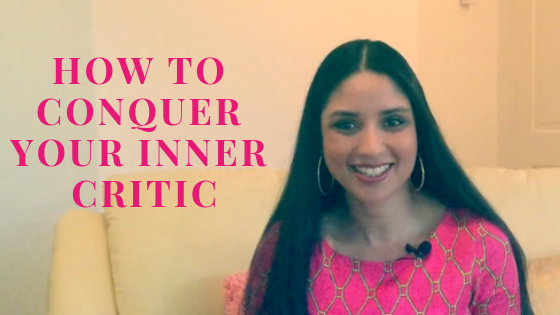 Once you shift to an empowered state and embrace the habit of celebrating your progress, you’ll be amazed at how quickly you start to conquer your inner critic. Comment below and let me know if you took the plunge and did your first victory dance!